Fig. 2. 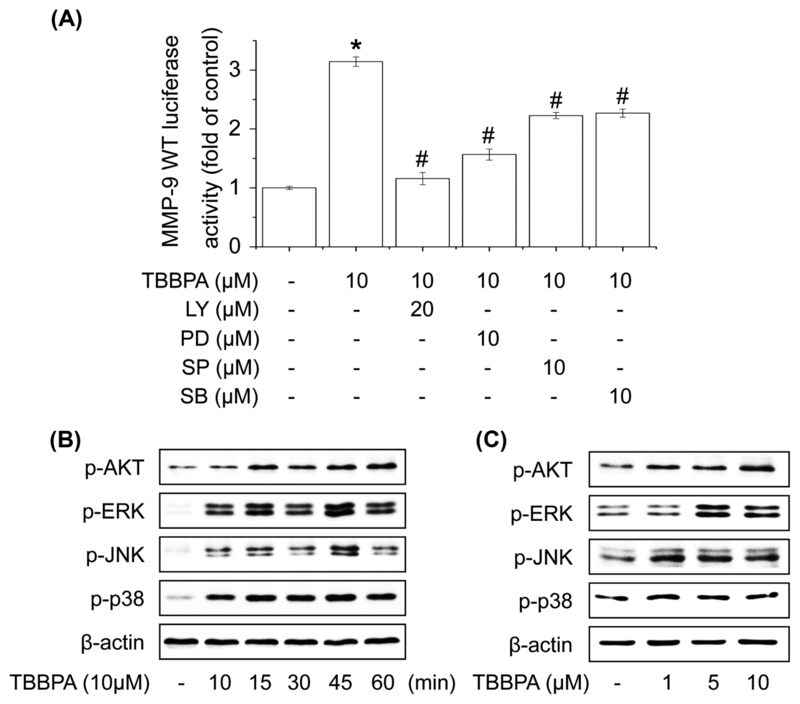 Effect of TBBPA on the activation of Akt and MAPK signaling pathways in human breast cancer MCF-7 cells. (A) Cells were transfected with MMP-9-Luc and then pretreated with the indicated inhibitor for 60 min followed by 10 μM TBBPA 24 hr. Cells were then harvested and assayed for luciferase activity. (B) Cells were treated with 10 μM TBBPA for 10, 15, 30, 45, or 60 min or (C) 1, 5, or 10 μM TBBPA for 30 min, and the phosphorylation levels of Akt, ERK1/2, JNK, and p38 MAPK were measured by Western blot analysis. Each bar represents the mean ± SD calculated from three independent experiments. *Significantly different from the control at p<0.01. #Significantly different from the TBBPA at p<0.01.